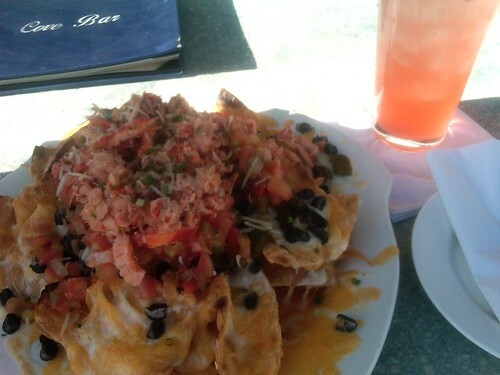 When I first started this blog I had the goal in mind of reviewing every single Mexican restaurant in Orange County. As time went on that goal seemed harder and harder to attain. While I'm still working at it I have also set some smaller goals. One of them is to try all the Mexican food at the Disneyland Resort. At first I thought that just meant eating at the three Mexican restaurants on the property, but then I found out it would entail more than that since Mexican food can be found at Disneyland that is not available in just the three three Mexican restaurants there. This spot is an adjunct of the Grand California Hotel that rests between Downtown Disney and Disney's California Adventure. It is primarily for hotel guests but anyone can go to it. 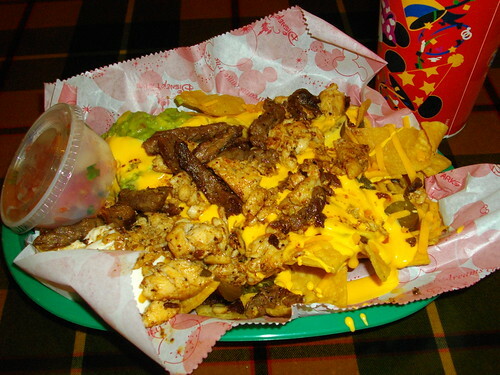 I believe you can have your nachos topped with chicken or beef. While nachos are not a super authentic Mexican food item Tortilla Jo's Taqueria is a much more authentic Mexican place overall than you would expect to find at Disneyland. I mean, they even have Jarritos and aguas frescas, and they make your tacos for you right in front of you. Or burritos, if that floats your boat. 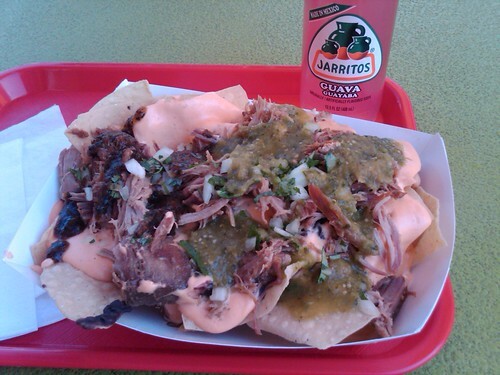 Here I got some carnitas nachos that beat out the other nachos shown here. This truck may not even be around anymore but if you see it you can get regular cheese nachos with jalapeños or chicken nachos with the works. 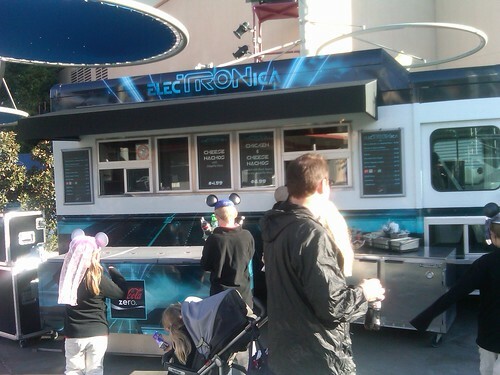 I just had to show it here because a TRON truck with nachos? Yeah, that's a unique concept. I think the jalapeños were supposed to be reminiscent of the glowing discs seen in the TRON movies. If you can find this bar behind King Triton's restaurant at California Adventure then you can order up some lobster nachos. Of the bunch, these nachos are most definitely meant to be shared as finger foods with probably 3-4 people, not as an entree for one. And don't be concerned that you'll be eating Sebastian from The Little Mermaid . Sebastian was a crab, not a lobster, despite looking like a lobster/crab hybrid. 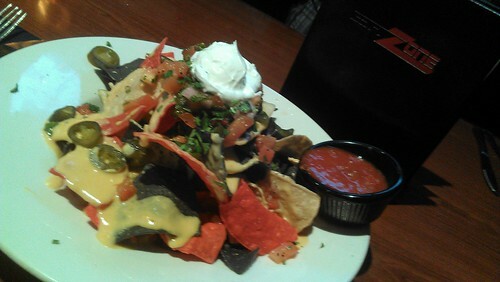 Okay, ESPN Zone also has nachos and I think they used to call them nachos but now they call them Zone Queso Chips (or Queso Zone Chips?). 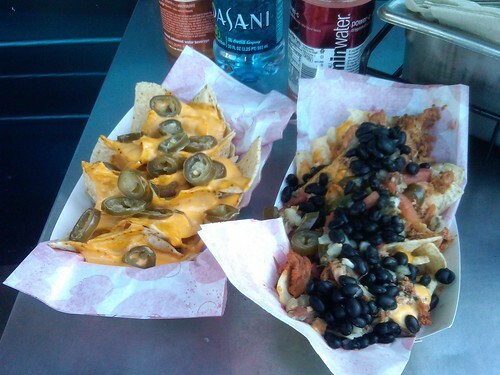 Are there any nachos available anywhere at Disneyland that I'm missing? If so, please leave a comment and let me know. Click any photo above to be taken to the complete flickr album.